This is quite an old approach to communication but no less effective for that. The more complex your communication gets, the less effective it is. Hard for the audience to follow in a logical pattern. When communicating we tend to try to tell the audience everything we know. Unfortunately the more we say, the less the message is understood. We are familiar with the content and we forget that it is NEW to the audience and they need help to process it. Ideally, your presentation should be one with a single idea which is structured in a straight-forward way and presented in an engaging manner. Nowadays, we increasingly hear business people complain that they are being bombarded with ‘buzz’ words and jargon when really all they want is to be able to fully understand and remember. A successful rugby coach only taught his team about a dozen ‘set pieces’. He said “A simple move, executed with precision and speed is more likely to push the ball forward than a complex one.” Simplicity was therefore the key to his team’s success. A Public Speaker also needs to pass the ball into the receivers’ hands (his audience). Complexity may cause the ball to be dropped. 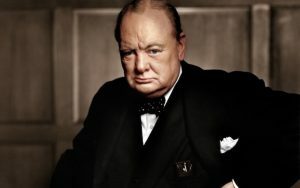 If you want to see a really powerful example of this idea in practice take a look at any of Winston Churchill’s war theme speeches and compare them with the way many politicians ‘wrap up’ information today in over complicated detail. I look forward to bringing you another message soon and thanks for reading this one. Happy New Year everyone. I thought you might like a different ‘voice’ to start 2017 so I am delighted to introduce my business connection, Dave Lineham, who is focussing on style in presentation and the importance of understanding your audience. With the passage of time, our world has seen values, customs, and aspirations change drastically. This change permeates all the way down to how we communicate with each other, and with our audience. The biggest mistake you can make as a speaker is to believe that members of your audience are all the same — that they think in the same way, respond in the same way, and can be reached in the same way. That’s simply not the case. Audience connection is about tapping the emotions of an audience to get them involved on a personal level. In this post I share some presentation tips for the millennial presenter (and that includes yours truly by the way!) who is grappling with how to connect with his or her audience. A core message is a crucial starting point for any speech or presentation. It is in many ways the key element for winning over an audience, regardless of which generation they come from. While many speakers simply choose a topic and write their speech completely independent from an audience, you need to flip that process around. Your message needs to matter to the audience. A major difference between baby boomers, generation Xers and millennials is how they relate differently to a core message. When attempting to appeal to different generations you need to find out what your audience wants to hear by completing some research. The WIIFY (what’s in it for you) is the benefit to a specific group of people. When preparing to pitch a new business idea to a group of investors, research shows that while millennials seek to understand how the idea originated, baby boomers prefer to focus on the specifications of the product or service you created. These needs both differ from those of generation Xers, who are more keen to focus on how the idea will serve the users needs. Audience needs change. So should your message. Another notable difference is how generations respond to delivery. A millennial presenter needs to carefully consider the varying motivators of fellow millennials, baby boomers and generation Xers. It’s important that you don’t create a barrier of authority between the audience and you. While a group of millennials may be content with listening to a fellow millennial outline a vision or idea uninterrupted, research indicates that baby boomers and generation Xers usually prefer plenty of time for Q&A (and time to verify the speaker’s credentials in the process). By planning some time for meaningful discussion you will appeal to baby boomers and generation Xers desire for feedback. This will help to create an atmosphere of trust or openness in the room. Another useful method for creating trust and openness is to ask your audience questions based on material covered up to a certain point. As a final thought, it is usually a good idea to be as near to your audience as possible when you speak. This lets them feel your energy and passion. Authority is one thing. Gaining trust is much more important. The reality is that millennials contrast greatly with baby boomers and generation Xers in character and in presentation style. Therefore, the millennial presenter must be very considerate of their audience when delivering a speech. However, with a few simple changes, using the tips outlined in this article as a starting point, any millennial can deliver an effective presentation capable of wowing a diverse audience. What generation do you fit into? And what tips can you offer about presenting to the different generations? Please let us know in the comments below. They’re always appreciated! Demographics are a powerful way to predict an audience’s ideals, but they aren’t guaranteed. The more you can learn about your audience by research the better you can directly tailor your message to them. Learn more about how to connect with an audience here. Dave created the ‘Communicate You’ blog in 2015 as a free resource to help individuals to become clear, concise and compelling communicators. His website places a particular focus on public speaking and presentations. Check out communicateyoublog.com for more, including a free E-book about preparing a speech from scratch. Follow Dave on Twitter @dave_linehan for the latest updates.